Do you ever wonder what it feels like to be a bird flying through the air? Now you can experience that feeling when you zipline in Oahu! If you are visiting Oahu, a zipline tour is one of the most exciting ways to get the most out of your visit. When you see the forests of Oahu, you will know that keeping your feet on the ground won’t be enough. You’ll have the desire to see them from an entirely new perspective. On a zipline tour, you can see the many different layers of the jungle from the ground all the way up to the canopy. Ziplines are a complete sensory experience, and Oahu offers sites unlike anywhere else in the world. On a zipline, you will not only see the extraordinary natural sights that Oahu has to offer, but you’ll be able to hear, feel, taste, and smell it as well.You will be able to scan the treetops for exotic wildlife and scour the forest floor for native flora. You can also gaze over some amazing vistas to see the beautiful landscape in all its glory. Listen to the sound of the leaves playing in the wind. You just might hear the sounds of some wildlife in the forest! Experience the humid air rush against your face as you sail through the sky. Savor the slightly salty island air as it blows inland from the ocean. Drink in the intoxicating scent of the natural rainforest. There is no way to see the jungles and mountains of Oahu like on a zipline. It is a completely unfiltered experience unlike any other. In Oahu, there are two tours that stand out from the rest as the best on the island. Below we’ll break down what they offer and why you should book one today. Located on the Keana Farm, with this zipline tour you’ll soar above fields and explore the active agricultural site from a bird’s eye view. On top of that, you’ll see some stunning panoramic views of both the ocean and the mountains of Oahu’s North shore. During the trip, the guides will teach you about the history of Oahu at each stop as you gaze out over the picture-perfect mountains and ocean scenery. Your tour guide will take you through three distinct periods of Hawaii’s history: Historic Hawaii, the Plantation Era, and Hawaii Today. You’ll be able to see the grow sites for papaya, eggplant, taro, and basil, and sample some of the mouth-watering apples, bananas, and cherry tomatoes that the farm produces. After the tour, you can continue your experience and try out some fresh produce. With the exception of basil, Keana Farms only sells their produce locally! Keana Farms is also a thrill seeker’s paradise, so you can get your adrenaline pumping as you soar across the lush landscape! This tour has the highest and longest ziplines of the three that we review. The 8 ziplines can be 150ft above the ground and cover 500 to 2600 feet in distance! With three sky bridges and some heart-dropping rappelling, this tour will satisfy your inner daredevil, making it a perennial favorite for tours in Oahu. However, the phenomenal views and sweet fruits make this tour totally one-of-a-kind. Double ziplines – ride next to someone! Breath-taking views of Oahu’s North Shore. To learn more about CLIMB Works and Keana Farms, visit their website. “My sister wanted to take my 8 year old nephew on his first zip lining experience and this place was perfect!” – Tania M.
Calling all movie and history fans! If you loved Jurassic Park and wish you could experience the stunning scenery of the movie up close, look no further than the Kualoa Ranch Jurassic Valley tour! The Kualoa Ranch is a 4000 acre private nature reserve with a fascinating history. It is owned by the family of Dr. Gerrit P. Judd, the first American doctor to translate medical texts into the Hawaiian language. The family has owned the entire property since 1880, except for a brief period during World War II when the land was occupied by the U.S. military as the location of the Kualoa Airfield. Today, the Kualoa Ranch is a popular tourist and filming destination. It has been the filming location for over 50 movies and TV shows, including Jurassic Park, Jurassic World, 50 First Dates, Godzilla, Lost, and Hawaii Five-0. The Ranch’s rich history makes it a fantastic place to get a better grasp of the Hawaiian culture. It is so culturally significant that it is on the National Register of Historic Places! A zipline tour gives you a unique perspective of an almost magical place. On the Jurassic Valley zipline tour, you will spend 2.5 hours gliding past the famous scenery while 100 feet above the ground. As you float over natural streams and native flora and fauna, you’ll see why so many major films have been set here: it is a spectacularly beautiful place! Each of the 7 ziplines is named after a historically significant aspect of the Ka’a’awa Valley, a sacred site for ancient Hawaiians. You’ll learn all about the deep connections between the Judd family and the native communities. The Jurassic Valley zipline is iconic in more ways than one. It was named the Readers’ Choice Award for Best Zipline in Oahu of 2017 by the Honolulu Star Advertiser! The Kualoa Zipline tour is a great option for large families where not everyone might want to go on the zipline adventure. The Ranch boasts a wide variety of activities to do, including ATVs, horseback riding tours, and truck tours of the jungle, so everyone can find something to do while you’re swinging through the trees! At $159.99 per person, this is an amazing opportunity for film lovers, history buffs, and families! The minimum age is 7 years old, so even the younger kids can come along for the ride! The Kualoa Ranch Zipline Tour is extremely popular, so you need to be sure to book early. At the time of this writing it was booked out for almost two weeks for two people! To learn more about the Kualoa Ranch Jurassic Valley zipline tour, visit their website today. Coral Crater is the hottest new adventure park in Oahu! Suitable for the entire family, this zipline tour is all about the adventure. 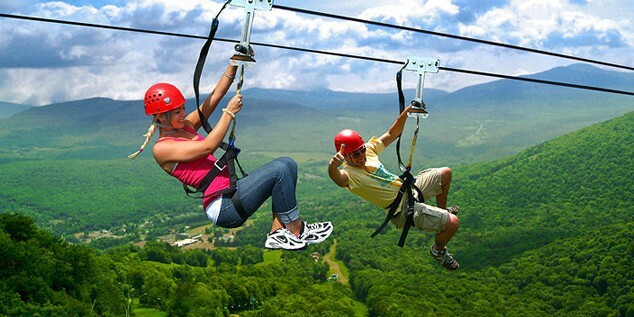 Fly across six different ziplines at speeds of up to 35 miles per hour for approximately two hours. It’s a whirlwind of fun that everyone can enjoy. If you are short on time, you can also do a half zipline tour. This one-hour experience is a great option if you have younger kids. As if whizzing through the jungle wasn’t enough, the tour finishes with a short free fall to add to the thrill! You can also add laser guns to the tour for added fun! Occasionally Coral Crater even offers nighttime ziplining for a different kind of adventure. It is totally exhilarating to pass through the dark jungle at such high speeds and an extraordinarily rare opportunity. At Coral Crater, everyone in your party can find something to do. The park has all kinds of packages for their many different activities, such as an aerial challenge course, electric bikes, climbing, ATVs, and movies. You can pick and choose your own adventure and find something everything in the family will enjoy doing.If you are lucky, you might even get the chance to meet Pu’a, the park’s resident pig! Coral Crater is sure to be a crowd pleaser. If you are a family looking for something exciting to do, or even just a large group looking for team building exercises, this is the place for you! At $129 per person for the full tour, or $79.99 for the half tour, the price is unbeatable. To learn more about Oahu Coral Crater Zipline Tour and book your adventure, check out their website. Whether you are looking for something more thrilling or informational, historical or family friendly, there is an Oahu zipline tour that can fit your needs. All of these tours are competitively priced and adhere to the highest safety standards, including automatic braking systems which prevent injury. They all also offer double ziplines so you can ride next to someone you love. In the end, you get to choose your own adventure with an Oahu zipline tour that fits your needs. So what are you waiting for? Make your vacation even more memorable with an Oahu zipline tour today.